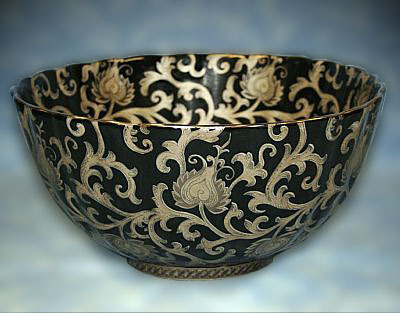 Midnight Floral Porcelain Large Bowl 12"
The delicate scallop shape of this bowl's lips extend all the way down to its interior. This piece is a perfect vessel to create a grand orchid arrangement in the foyer or dining room of homes with Chinoiserie or modern interiors. The midnight black background adds drama to the floral and vines design. 12" diameter. Imported. or 2-day delivery. See shipping options below. Quantity.. 1 2 3 4 5 .